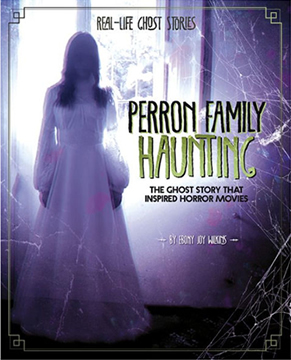 PERRON FAMILY HAUNTING by author and educator EBONY JOY WILKINS, Ph.D. The Perron family received this advice from the previous homeowner of their Rhode Island farmhouse: “For the sake of your family, leave the lights on at night!” A ghostly witch named Bathsheba led the haunting of the Perron family, physically and psychologically tormenting them. This legendary ghost story eventually became the subject of the movie The Conjuring, and continued to haunt the Perron family for years to come. 1. If your family was moving into a new home and the old owners warned you to leave the light on at night, how would you react? Would you still move in? Why, or why not? 2. You’re all settled into your new bedroom, but you see a ghost lingering in the corner when you turn off the lights. What do you say to the ghost? What do you do when the ghost answers? 3. There is a door in the basement of your new home that you cannot open no matter how hard you try. What do you think is behind the door? Do you keep trying to open it? Or do you leave it locked shut? 4. The ghosts in your new home are becoming a problem. You get one chance to catch the ghost and make them leave for good. What’s your plan? Who do you call for help? 5. Now, your friends want to hear your ghost story. Write about the paranormal activity in your home.